Paleontologist Jack Horner is like a lot of us: as a child, he wanted a pet dinosaur — a dream he's working to make reality. 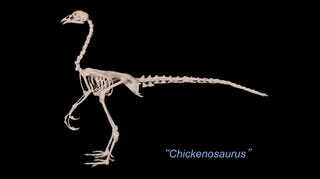 In a recent TED talk, Horner explained why the Chickensaurus is dinosaur's best hope. In March, Horner gave a talk in Long Beach, explaining his quest to make dinosaurs from chickens. He starts where you would expect: with Jurassic Park. Paleontologists did undertake a search for dinosaur DNA with the hope of possibly using it to reconstruct a dinosaur in the modern era, but when the search proved less than fruitful, Horner turned his attention to the humble chicken. He jokes that, while birds have technically been classed as dinosaurs, that hasn't satisfied the sixth graders. "Velociraptors are cool. Chickens aren't cool." But he is trying to make chickens more like dinosaurs through the process of atavistic activation — the "switching on" of earlier evolutionary characteristics. He notes that embryonic pigeons, for example, have an arm formation similar to that of a velociraptor, but adult pigeons do not. He and his fellow researchers and looking for the genes that activate those changes and find ways to inhibit the changes. He envisions a multi-fingered, toothed, and long-tailed chicken he has dubbed the "Chickensaurus" — sure to be every dinosaur-loving child's best friend.